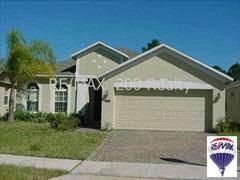 MIRABELLA Live in this beautiful home with 4 bedrooms, 2 baths, 2 car garage (with brick paver driveway), backs to reserve and includes indoor utility room, separate shower/tub in master bathroom and split floor plan. Pets Friendly Property (with approval and non-refundable pet fee). *Bonus Amenity Included* - A portion of resident's total monthly amount due will be used to have HVAC filters regularly delivered to their doorstep under the Utility & Maintenance Reduction Program. This saves 5-15% on your energy bill and helps ensure a clean, healthy living environment. Contact Shawn at extension 407-571-1404 for more information.